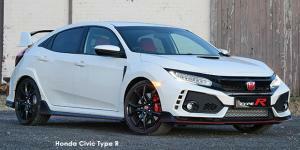 The Honda Civic Type R, available at Mekor Honda Tygerberg, has a functional, aerodynamic style. The sporty look features LED front lights, a rear wing, red and carbon fibre dashboard trims and red bucket seats—exactly what you need to feel like an F1 race car driver. The Honda Civic Type R features an electronic parking brake allowing for an expanded storage cavity between the front seats. Visit Mekor Honda at Mekor Honda Tygerberg for Cape Town Northern Suburbs, Stellenbosch and Somerset West to awaken your inner racing driver with Honda Civic Type R’s high performing, turbocharged 2.0L VTEC DOHC 16V direct injection engine.